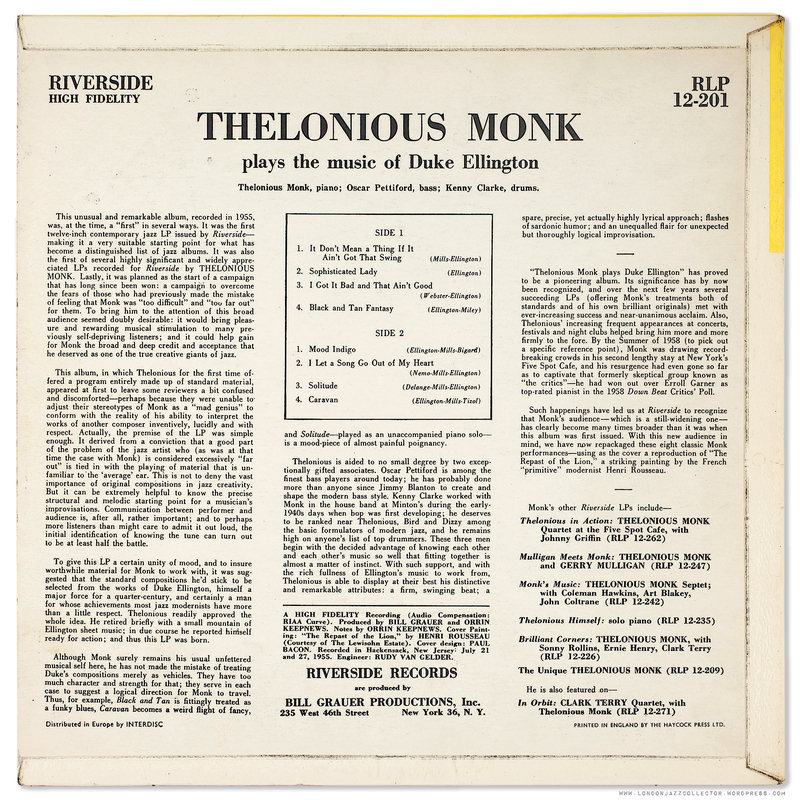 Monk reinvents Ellington’s classic and the three swing like something else. Pettiford, phew! 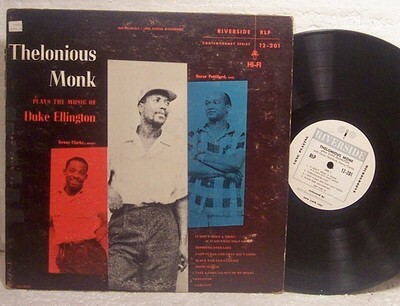 At the time of his signing to Riverside, Monk was highly regarded by his peers and by some critics, but his records did not sell in significant numbers, and his music was still regarded as too “difficult” for mass-market acceptance. Riverside managed to buy out his previous Prestige contract for a mere $108. He willingly recorded two albums of jazz standards as a means of increasing his profile. 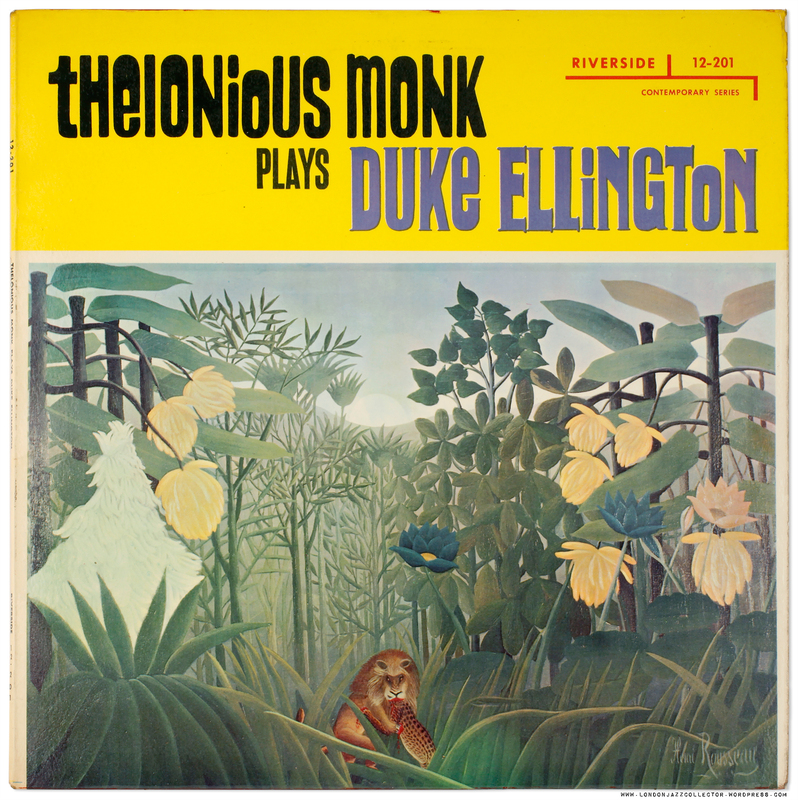 The Critic says… with Caravan, Monk masters the Ellington material, more than a tune; an instrumental composition. Orin Keepnews thought he could reach a wider audience for Monk through the use of standard tunes, however a musician of Monk’s uncompromising originality was never going to be easily accepted by a large audience. 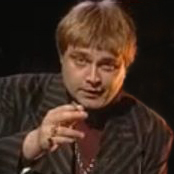 Plink plonk…plink. Nice. UK Riverside release, blue twin reels which date from a few years after the US release. Philips UK pressing, mastered locally from copy tapes, regular Philips UK 420 matrix Side 1, but partially-etched matrix on Side 2 – something I’ve not seen before on the normally very disciplined Philips production process. Source: London record store. From a collection claimed to have been dormant in an attic over thirty or more years. Not played for thirty or forty years. That is the best kind. This entry was posted in Riverside, Thelonius Monk and tagged Henri Rousseau, Kenny Clarke, Oscar Pettiford, Riverside, Thelonious Monk by LondonJazzCollector. Bookmark the permalink. Great jazz album, and I was very excited to find one with the pastel blue on white label (deep-groove, no inc. and the 418 W 49th address) and the first cover with orange, white and blue shaded photos of Monk, Clarke and Oscar Pettiford on a brown blackground, at an estate sale the past weekend for 3 dollars (us). I wish I could say this happens all the time, but I’d be lying. I do have a question, though. Since the example of the 12-201 label shown on the Riverside primer on LJC is gray over white, I would guess that there must be second Riverside pressings that would still have a white label, but with one of the later blue variations. Is my guess right? Can anyone tell me? btw, I’m hanging on to it second issue or not! This is my first and only Riverside white label. Sorry for the long comment. I get carried away…. Having sweated the label pictures found on the internet, it is likely but not proven that the earliest titles and pressings are the grey on white, followed by the pastel blue on white, but I am not sure it matters greatly unless you are spending a big sum. For three dollars, take your pick. This was the first jazz LPs I ever bought. It made Duke Ellington’s music quite difficult to appreciate later on. Hey, I’ve got one of those “drab and conventional first cover(s)”! Riverside, white label–very cool. Would it be rude of me to ask which shop? And whether there is anything good left? Love everything Monk, can’t help it. I hope to someday bump into a box of untouched records in someone’s attic as well. Did the record store owner tell you what else was in the box? Errr, yess. I bought four of them. Feature in posts shortly.